Pelleted newspaper products are generally made from recycled newspaper. 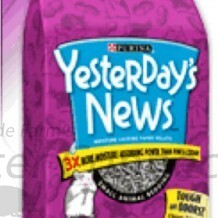 Purina’s Yesterday’s News is a popular pelleted kitty or ferret litter. Second Nature Dog Litter is similar to Yesterday’s News, except that it is cheaper. It is reported to work well at controlling smell but we do not have personal experience with this product. One must take care to ensure that the hedgehog does not ingest this product. It will expand and swell, and could seriously harm or kill your pet. They have little odor and are generally the size and shape of rabbit pellets. The dark gray color of this product may make the cage look dirty or disguise abnormal hedgehog feces. The gray can also “rub off” onto the hedgehog making them look very grungy. It is not too bad on a standard, but it is very noticeable on an albino. It can also make their white fur turn into a grayish color. (Belval). Some products like Care Fresh are made out of 100% wood pulp and are light and fluffy. It is very absorbent and doesn’t disintegrate when wet. We have had some reports that it is virtually dust free, as well as conflicting reports that it is very dusty. We have found it to be just slightly dusty and the amount of dust depends on handling and burrowing of the animal. Several colors and varieties are available. 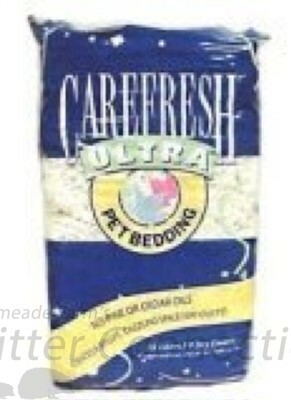 Many veterinarians recommend Care Fresh Ultra. The traditional gray color is not very attractive and may make the cage look dirty or disguise abnormal hedgehog feces. We have found that for best odor control and appearance, cages should be cleaned twice a day. There is a risk of the hedgehog ingesting this material with food or out of curiosity. 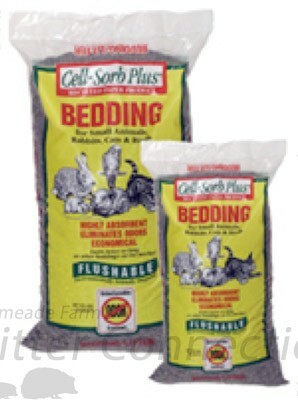 Some hedgehogs have been reported to have died from eating this bedding. Paper swells when wet and can cause an intestinal blockage. This product is so lightweight that it may be kicked out of wire cages. It is clingy and can be difficult for a vacuum cleaner to sweep up. Cell-Sorb Plus is a safe green product. Cell-Sorb Plus is heat treated and made with recycled paper and a non-toxic, patented, neutralizing chemical (gypsum). There are no enzymes or biocides in the paper bedding to control odor. The ink in the paper is soybean-based. (http://www.cell-sorb-plus.com). The pieces are about ½” long and are quite chunky and heavy. They are heavier than Care Fresh, but flakier and softer than a pelleted product. It is virtually dust free but the pieces can crumble. The manufacturer claims that it completely eliminates ammonia levels for up to three weeks. Cell-Sorb Plus is 400% more absorbent than wood shavings. It absorbs urine, neutralizes urine odor, and allows the liquid to evaporate. It even pulls the moisture out and dries the feces. (http://www.cell-sorb-plus.com). According to the manufacturer, it is more economical to use than wood shavings. You don’t have to change it as often, so you use less and have less to dispose of. Also, it can be flushed (in moderate quantities). (http://www.cell-sorb-plus.com). Cell-Sorb Plus is environmentally friendly because it is biodegradable and can be used as a landscaping fertilizer and soil conditioner. (http://www.cell-sorb-plus.com). We found that our cages needed to be cleaned more frequently when compared to pelleted pine. Hedgehogs exposed to this bedding for the first time may ingest bedding which could cause an impaction and subsequent death. Always remove any bedding if a hedgehog is ingesting. Plain, unprinted newsprint can be used in sheets to line the bottom of the cage. Most newspapers will give away or sell very cheaply, the paper at the end of their newsprint rolls. Newsprint is excellent for viewing sick or ailing hedgehog feces. (Belval). It is good for people or hedgehogs with allergies (Belval). This type of bedding generally does not stick to hedgehogs with wounds or sores like other bedding options. The hedgehog cannot burrow and will mostly try to get under the newsprint, which leads to overturning food bowls and feces/urine directly on the cage floor (Belval). Daily changing of the liner and possible disinfecting of the cage may be required. Some hedgehogs like to eat paper, and if this is the case with your hedgehog, you will have to look out for another option. Your hedgehog may also track feces and urine all over the cage, and furnishings because of the smooth surface of the paper. 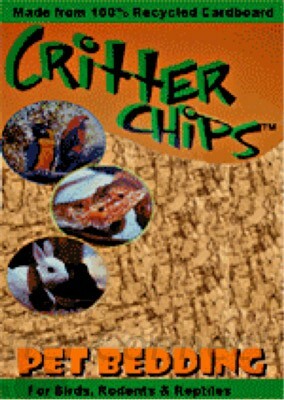 Critter Chips is AirLite’s small pet bedding. It is “double cut” to produce a smaller sized, randomly shaped chip. Virtually dust-free and very absorbent, all their bedding products absorb up to three times their weight in water. Low-dust environments reduce the likelihood of wood dust induced respiratory irritations and allergies, in both the animal and caretaker. All AirLite’s products are produced with recycled cardboard. They proudly pursue adding to the environment by recycling, composting, and other means rather than encroaching on nature’s habitat. Critter Chips are great bedding for a wide assortment of small and medium-sized animals, including, but not limited to birds, cats, dogs, rodents, cavies, ferrets, and pot-bellied pigs. At this time, we have not been able to try this product for ourselves.